The ACT is a standardized college admissions exam taken by students across the country. In Kentucky, every student enrolled in public schools takes the ACT during their junior year. ACT scores are a very important component of college applications, and high ACT scores can help students qualify for scholarships. Students’ performance on the ACT is reflective of both their general academic knowledge and their preparedness for the exam. The average ACT score for JCPS students has remained very stable since 2012, fluctuating between 18.6 to 18.9. The average JCPS student scores around the 38th percentile, meaning that they do better than 38% of all students who take the exam. 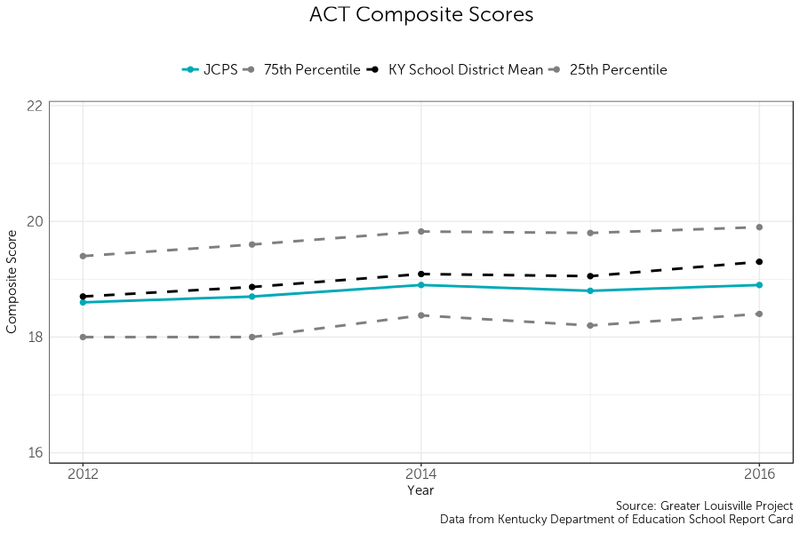 JCPS students consistently perform slightly below the Kentucky average on the ACT, and ACT scores have also not increased as much for JCPS students as they have for students in other school districts since 2012. 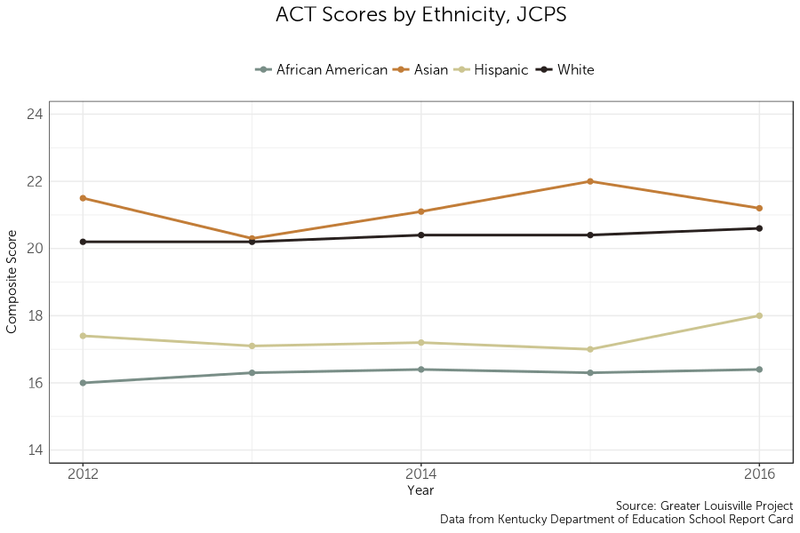 The disparity in ACT scores among students of different races is large and significant: Asian JCPS students score around the 54th percentile of test-takers on average, while African American students only average a score around the 22nd percentile. These differences demonstrate very different levels of academic preparation and competitiveness in college applications. While ACT scores have not fluctuated much since 2012 for white or African American students, Hispanic students saw a score jump of one whole point between 2015 and 2016.